The Yeni Cami, The New Mosque or Mosque of the Valide Sultan is an Ottoman imperial mosque located in the Eminönü district of Istanbul, Turkey. It is situated on the Golden Horn at the southern end of the Galata Bridge. It is one of the best-known sights of Istanbul. 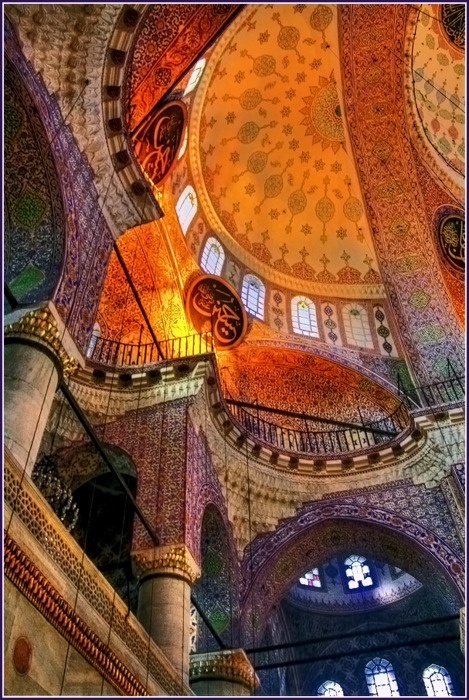 The interior of the mosque is a square 41 meters on each side. The central area is defined by four large piers which are the main support for the dome. On the sides and rear of the central area are colonnades of slender marble columns connected by arches in a variety of styles. The dome is 17.5 meters in diameter and has a height of 36 meters. Like many other Ottoman imperial mosques, on the 4 corners where the dome meets the pillars holding it up, are calligraphic plates with the names of the first four khalifahs, Abu Bakr, Umar, Uthman, and Ali. The interior space is extended with semi-domes along the east-west axis of the building, with smaller domes above each corner of the nave and even smaller domes above the corners of the galleries.